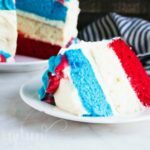 This is the perfect patriotic cake for the summer! This simple layer cake is full of fun and easy to make. Dazzle guests with this easy recipe. 1 package White box cake mix Baked in an 8" round pan. Bake cakes according to package directions in 8 or 9-inch pans. Allow to cool completely and remove from pans. Using a mixer, cream together the cream cheese and butter until smooth. Mix in the powdered sugar and then add in the vanilla. Spread out cream cheese frosting over the first cake layer and then stack another layer on top of that one. Top with strawberries and blueberries or sprinkles for a festive finish.